An unorthodox approach to the nature of immunity is present­ed, differentiating it from reactivity. Immunity is a gestalt force, all to the good of an individual, making the concept of auto-immun­ity ridiculous and rejectable. Reactivity is a vector force that may protect or persecute; it is basically concerned with restoring the integrity of the human body. The concept of cytologue amplifies the idea of integrity, and allows reactivity to fight a microbe, heal a wound, reject a graft, and give rise to "auto-immune" disorders, by means of a concerted CelluloHumoroVascular Response. In order to gain an insight into the complex interactions and interdependancies between endocrine and exocrine glands, between incretory and excretory cells of the pancreas, and gut and endo­crine hormones, we undertook to study the effects of subcutaneous pentagastrin on blood, sugar, serum amylase, lipase and calcium in 15 normal control and 50 radiologically proved duodenal ulcer subjects. After subcutaneous pentagastrin, there was no change in one hour, in the values of serum calcium, amylase, lipase, and blood sugar, in both normal control and duodenal ulcer subjects. Since it did not produce any significant change in serum calcium levels, it seems that the stimulatory effects o f pentagastrin may not necessarily be due to changes in serum calcium levels. 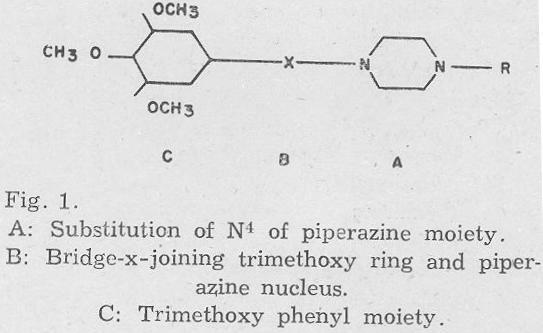 The various compounds belonging to the 1-4 disubstituted piperazine series exhibited the adrenolytic, hypotensive and CNS depressant activities. Appropriate substitution could also lead, to a dissociation of these pharmacological effects. 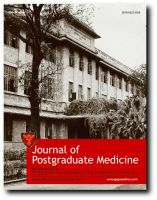 It was observed that adrenolytic and CATS depressant but not the hypotensive pro­perty of these compounds was greatly susceptible to structural changes in their molecular configuration and a relationship was evident between adrenolytic and hypotensive activity as well as between CNS depressant and hypotensive activity with different structural variations. 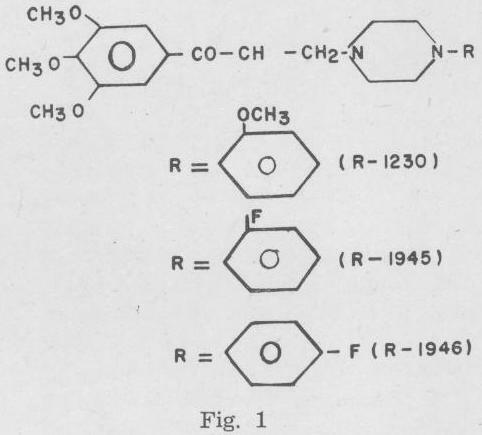 Comparison of central nervous system depressant activity of R-1230, R-1945 and R-1946 (disubstituted piperazine derivatives) employing various pharmacological tests revealed that R-1230 (Orthomethoxyphenyl derivative) and R-1946 (Parafluorophenyl derivative) were more potent than R-1945 (Orthof luorophenyl derivative) as CNS depressants and the CNS depression produced by these agents could be classified pharmacologically in same group as major tranquillizers like chlorpromazine. It also signified, that presence of methoxy or fluoro group within the drug molecule does not necessarily determine the activity but the position o f these groups in drug molecule is mainly responsible for determining de­gree of CNS depressant activity exerted by the compound. 1. Mean age o f menarche was 14.2 years in a group o f 418 girls. 2. There was a high correlation between socio-economic con­ditions and the mean age of menarche. Medical students had earlier onset of menarche compared to nurses. 3. Mean age of menarche was also related to the number of sisters and the total sibs in the family and to the residence of the persons. 4. There was no correlation between the age of menarche and the dietary habits of the persons and the outdoor activities of a person. Serum lipid phosphorus, phospholipids, serum total chole­sterol, free cholesterol and serum lipoproteins i.e. omega (Chylo­micron), beta and alpha-lipoproteins were estimated in 60 healthy children below the age o f 12 years to assess the normal levels. Electrophoretic separation of serum proteins on absorbent paper was used for the separation of three fractions of serum lipopro­teins. 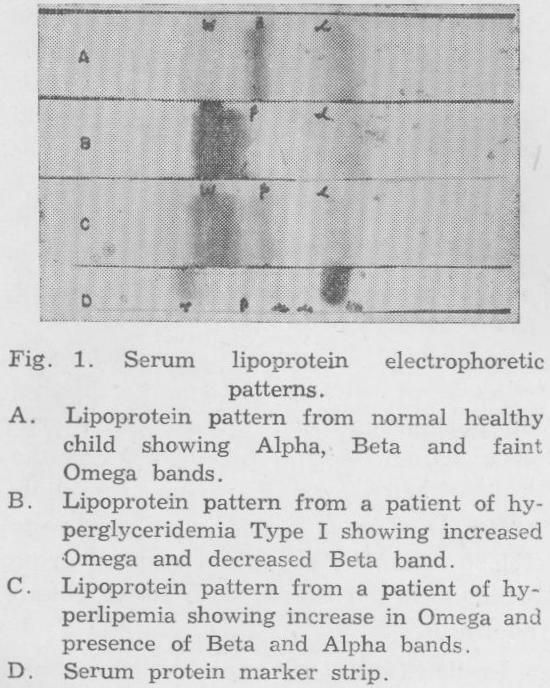 The pre-beta lipoprotein-band was not seen in all the 60 normal children under this study. The levels of serum lipopro­teins found in these children were as follows: Omega-12.99 ± 2.27%; Beta-61.59 ± 2.90% and Alpha-25.37 ± 3.08%. Similarly, the serum total phospholipids was 189.45 ± 27.73 mgm.% and serum total cholesterol level 170.73 ± 23.47 mgm%. Two preparations o f oral iron, were evaluated in normal volun­teers and in patients of iron deficiency anemia. The study in 10 normal volunteers measured the bioavailability of the two prepa­rations. The study in 20 patients assessed the therapeutic equiva­lence and tolerance. 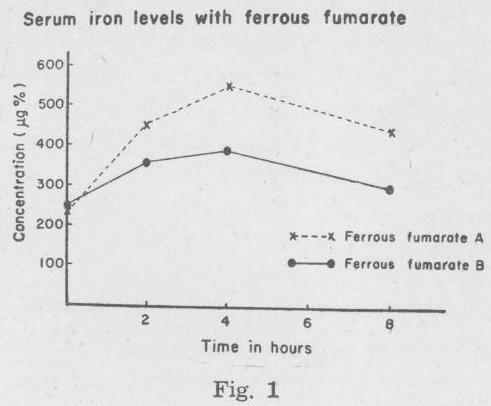 In the volunteer study, serum iron levels at 4 and 8 hours were significantly higher with the iron vitamin-­mineral combination than with the plain iron. The AUC was also significantly higher. In patients there was no difference in the effect of the two formulations. With both there was a rapid rise in Hb, PCV and reticulocyte count in the first week, after that the rate of increase was slow. Both preparations were equally well tolerated. A case of diabetic Keto-acidosis due to growth onset diabetes was treated at the K.E.M. Hospital, Bombay. This patient received over 500 units of Insulin in six hours' time after detection of diabetic keto-acidosis. Though his keto-acidosis came under control at the end of six hours, his blood sugar rose from a value of over 500 mg% to a value of over 3000 mg% during this period and the patient died due to hyperosmolar coma.